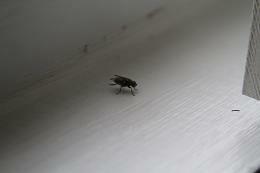 Cluster flies are large, black flies that come inside your home in winter and early spring. These flies are ¼" to 3/8" long, black or gray in color, with wings that are overlapping when resting. The name comes from their preference to live clustered together inside your attic. Experts believe the size of the clusters depend on the amount of rainfall throughout the summer months. These pests luckily do not reproduce indoors and are simply wintering with you. They have an interesting lifecycle, developing as parasites inside the bodies of earthworms. Three generations of flies are produced each summer and the last flies of the season enter your home during late fall. Houses located on hills or exposed elevated locations, particularly white and light colored houses experience more problems with cluster flies. Cluster flies enjoy sunning themselves on the exterior surface of home's south or west side location during late summer days. When cold weather arrives, they enter you home through cracks in the foundation or siding and around windows and fireplaces. They remain in a hibernation state, enjoying both security and protection, until they feel the warmth of the sun or are warmed by your heating system. Once warm, they come out of their dormancy state and begin moving about. They are sluggish, disoriented and crawl randomly. They enter the living space through electrical outlets or small openings around moldings, baseboards, and windows. They are seeking an escape route and you will see them moving toward doors and windows. They are not attracted to indoor food. You may find them on their backs on the floor or on windowsills, spinning and making noise until they become tired. You will want to remove the flies you see since they carry many organisms of infection on their bodies. Dead flies should also be removed since they attract other insects (as a food source). Because the larvae of cluster flies require an earthworm host to survive, the more earthworms there are outside your home, the more likely you are to experience cluster flies inside your home. Consider adding a birdbath or feeder to attract birds to your yard to help reduce the earthworm populations. Controlling the attic flies is best done in late summer and fall. Because they are hiding under insulation and deep in cracks in your attic space they are difficult to treat with spray or fogging machines. Flypaper, strips, and zappers do not work in attics for the same reason. Enviroguard pest management professionals will treat your home's exterior in early fall with a residual pesticide. Spraying insecticides combined with sealing all interior and exterior cracks and installing screens behind attic vents is necessary for prevention and control. To kill the flies in your living space during the winter and early spring, Enviroguard uses a safe, insecticide aerosol sprayer along with integrated pest management techniques of flies attempting to make it into your home. Last spring and summer, our manufacturing facility experienced a huge problem with flies entering through dock doors. What can we do to prevent this happening this year? Also we have a problem with mice entering our office. How can they be stopped? In facilities where loading dock doors are always open, flying insects of all types (as well as rodents) can be a problem. They are entering your facility to find food, water, and a harborage site. Since you are required to keep the doors open at all times, installing a forced air curtain is the best idea. You have probably experienced a sharp flow of air when you enter a fast food restaurant or convenience store. The strong air current deters flying insects from entering. Some businesses mistakenly use pheromone traps near dock doors thinking these chemical attractants will lure pests into the traps. Unfortunately they have just the opposite effect of attracting more pests. As for your second question, preventing mice from entering your office building, the common points of entry are through holes around electrical utility lines and plumbing pipes. Have your maintenance department use a sealant to seal and caulk the holes. Do not use expandable foam in the holes because rodents can easily chew through this material. Do not use copper mesh to plug the holes because it is conductive and not for use around electrical lines. Remember mice can enter through a ¼” hole. Be vigilant about finding and caulking holes. Once pests are in the building, Enviroguard pest management professional can work with you to identify locations to install caulk, mesh, and other sealants around pipes, utility lines, and other entries and voids between rooms. With this method the mice can be isolated to one area of your office and then traps and baiting can be used to quickly eliminate the colony inside the office. Why am I noticing flies by the drain in my workshop sink? You sink has a curved trap that holds water. This water is a barrier to block the trap and protect you from sewer smells and prevent the entry of pests. In a seldom used sink, this water may evaporate, so you lose this important protection. The flies and their maggot offspring will be attracted to the area. This is a growing problem as some homes and commercial locations are using more hand sanitizing solutions instead of soap and water for hand washing. Using the sink periodically will help to avoid this problem.